A breathtaking match-3 game with innovative mechanics! 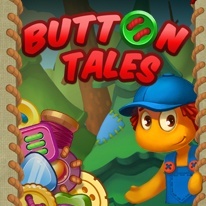 Button Tales is a breathtaking Match 3 game with innovative mechanics. Earn gold buttons and use them to restore your world while playing over 100 unique levels. For the ultimate challenge, unlock all of the achievements to gain access to the bonus levels! Excellent gameplay, cute characters, bright and colorful environment, great music and effects will help you to dive head first into the game. Challenge youself with timed levels or play with no time in Relaxed mode.